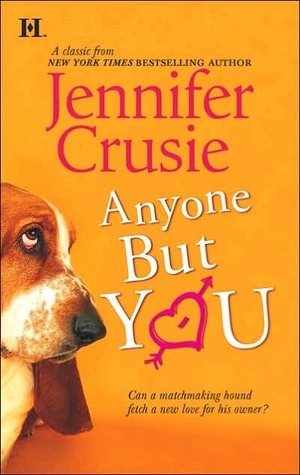 Jennifer Crusie books are quickly becoming my go-to adult rom com's. I'm a little late to this party, seeing as though she's been around for awhile, but I am so happy to be discovering her books now. Better late than never, right? Anyone But You is a quick, hilarious, and whole-hearted read. I loved Nina's character and her drive to start over new after walking away from a decade too-long marriage. But of course it was her new roommate, Fred -- the adorable, lovable dog -- that stole my heart. One of my favorite romantic tropes is the neighbor next door, or in this case just a fire escape below. Nina meets Alex, a young doctor that lives just below her, thanks to Fred's escapades. Their attraction is instant, but Nina's fear of image and what will people think of her if she's dating someone so much younger, controls her inhibitions for quite some time. But Alex's persistence and oh so charming wit ultimately wins her heart. Jennifer Crusie does an excellent job of engaging the reader with hilarious dialogue, quick storylines that never drag the plot down, and building the tension before it all bursts. I highly recommend experiencing this author if you have not already, and like me forge a path of discovery as I encounter all her backlist titles. ANYONE BUT YOU certainly sounds like a romantic comedy, and those are always up my alley! I think I've only ever read one novel from her (BET ME), but I remember finding the story pretty charming and fun. I think I'll definitely have to check out more of her stuff now!